FAA Required Airworthiness Limitations for Legacy Cessnas | Tennessee Aircraft Services, Inc. Spoiler alert: this is not a completed article. By that, I mean there won’t be a neat and tidy conclusion at the end. At the time of this writing, I am still awaiting some definitive information from the FAA. In the meantime, our discussion starts with the cantilever 210 wing spar but reaches into the near future of all the legacy airplanes. We won’t be delving into technical topics; instead, we’ll be venturing out into the world of manufacture/owner/FAA politics. This area isn’t in my normal comfort zone, so bear with me as I try to navigate us through this new (to me) and controversial territory. The latest in this series of documents appeared very quietly in the form of a revision to the 1967 and newer 210 service manuals. It’s also the most controversial. I spend a lot of time in the legacy Cessna service manuals making sure all the mechanics in my shop and I are using and referencing the correct procedures. Also, as a Cessna authorized service station, we are required to have the most recently revised manuals which we access via the internet directly from Cessna. Last week I was looking up some details from section 2A Supplemental Inspection Document (SID) in a 210 service manual when I noticed a new section 2B Airworthiness Limitations had been added. It’s only four pages, but its appearance has huge implications for the entire legacy fleet. I made several calls to Cessna to express my concern that such a major change had occurred to the manual without prior notification. 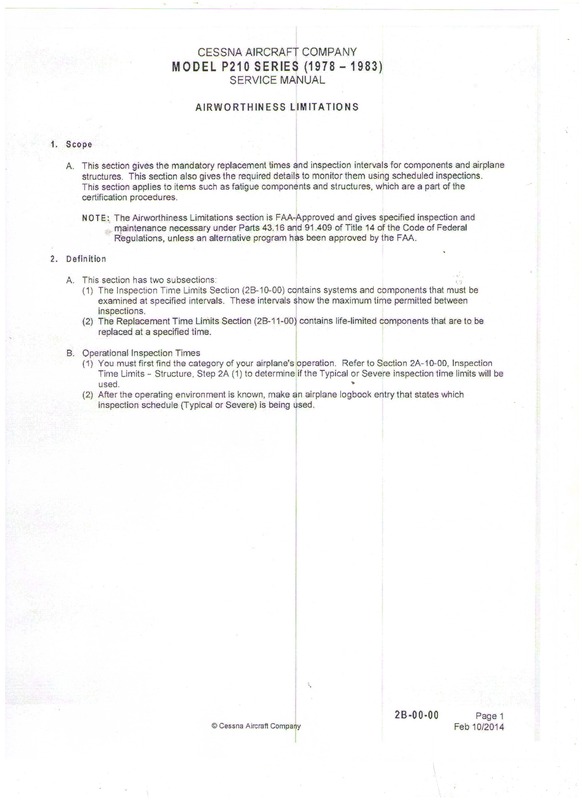 As it turns out, there was a service letter intended for transmittal in May of this year to announce the addition of the Airworthiness Limitation section of the manuals. After my calls, that service letter was posted via the Cessna Support email on September 4th. If you take a look at SEL0504 you’ll note it is dated May 6th of this year. Cessna explained there was a disconnect between the group responsible for the service manual revision and the group tasked with publishing the service letter. In any case, the manual has been revised, the service letter has been posted, and we now must deal with the change. The four pages of the new section consist of a List of Revisions, Airworthiness Limitations, Inspection Time Limits and Replacement Time Limits. The List of Revisions page mostly tells us that this new section of the service manual is FAA Approved and that it was originally issued on February 10, 2014. The Airworthiness Limitations page explains how the system works. Basically, it reiterates that this is FAA approved and adds that the inspections and maintenance described are necessary under 14 CFR 43.16 and 14 CFR 91.409. It also explains the existence of the next two pages as well as some details about determining the aircraft’s operational category and environment. 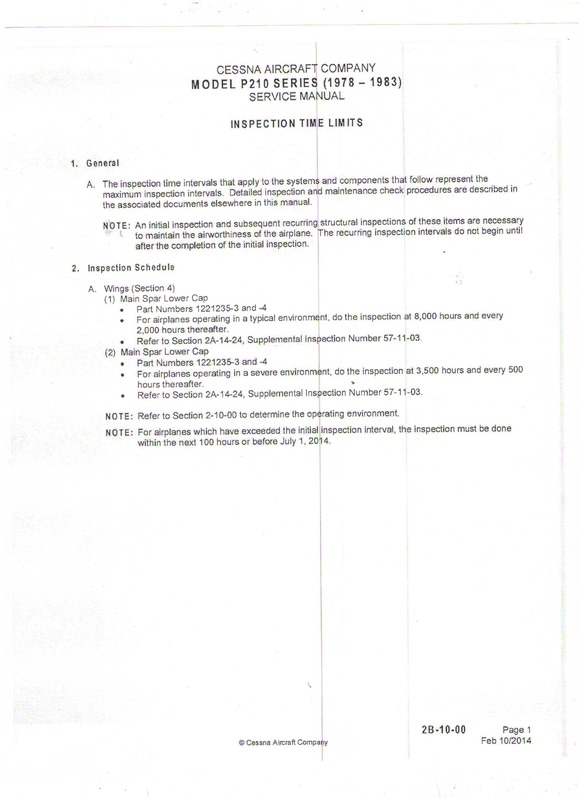 Page 3 gives an overview of the inspection intervals and what is to be inspected. It directs the reader to section 2A1422 for a new SID, which defines the new wing spar inspection procedure including Eddy Current inspection. My article on Eddy Current in the June issue of this magazine has more information on the inspection process. Next on page 3 is a note referencing section 2A1000 of the manual for details on how to determine the operating environment of the aircraft. This determines which inspection interval must be used. 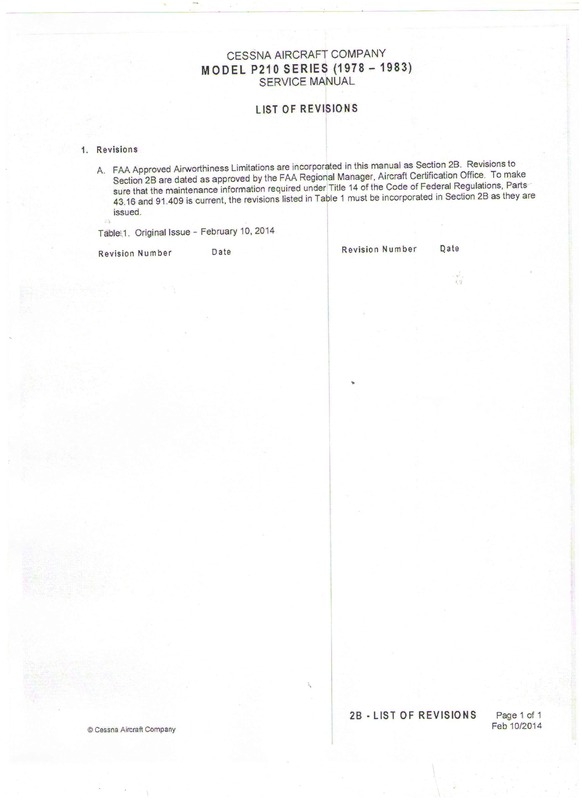 Last is a note advising that the owner/operator has 100 hours of flight time from the issue date (Feb 10, 2014) or until July 1, 2014 to perform the initial inspection. It doesn’t clarify to use whichever comes first or if one could wait until whichever comes last. Since apparently no one in the field knew about the change to the manual until Sept. 4th, we’ll all hope the intention was for whichever comes last. 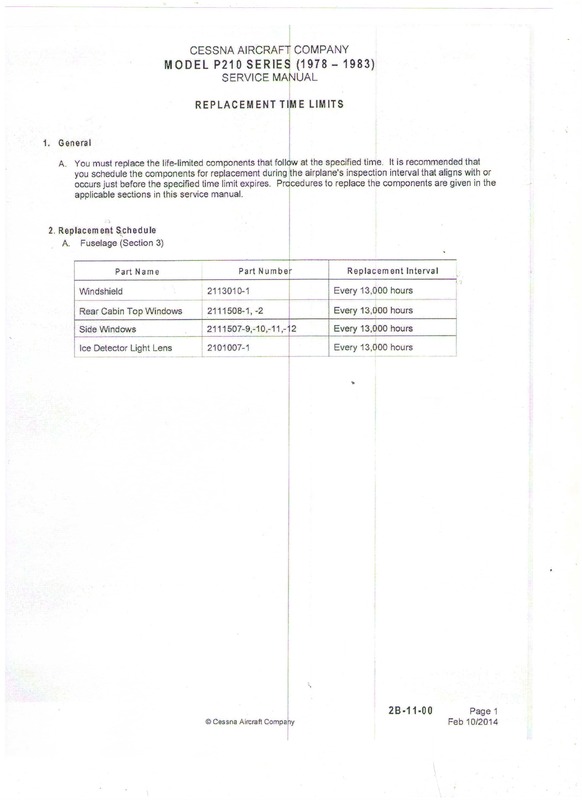 Page 4 gives a list of items that must be replaced and when. At the moment, only the pressurized 210 has any components listed on this page. The windshield, windows and ice detector light lens must be replaced at 13,000 total flight hours. The airworthiness limitation refers to a new SID in section 2A which details the inspection requirements as well as some details about determining compliance times. There are several historical items about the aircraft that must be determined and documented in the maintenance records. These details include determining where the airplane has lived all its life and how long it might have been in a harsh corrosive environment. Also of importance is to determine how much time the plane spent operating in any exceptionally stressful flight operations such as pipeline patrol, fish spotting, low altitude survey work and so on. For most of our planes, finding this historical information may prove to be impossible. Not knowing will force the use of the most restrictive inspection intervals per the SID. It’s also unclear who is responsible for making this determination and recording it in the records. What proof is required to support the decision? As the aircraft continues to age, the dynamics of the aircraft usage and time spent in the harsh environment locations will change. A method will need to be employed to periodically review this information and modify the inspection intervals, if necessary, to stay in compliance with the airworthiness limitation. If the decision is left to the maintenance provider, the default position would be to choose the initial inspection at 3,500 flight hours with a 500 hour recurring interval. The owner would likely lean toward the 8,000 flight hour initial inspection with the 2000 recurring interval. The former presents the least liability. while the later requires defensible documentation and continuing revision. Aircraft and aircraft component manufacturers publish service bulletins, SIDs, time change items and inspection intervals with several imperative descriptors such as Mandatory, Required, Emergency, Compulsory, Urgent. If you’re a regular reader of the Cessna Pilots Association magazine. you probably understand that for those of us operating under the rules of 14 CFR 91, none of these is mandatory in the eyes of the FAA. Other countries’ aviation regulating bodies may view these differently, and some are still deciding. An Airworthiness Limitation section follows different rules. You might note there aren’t any qualifiers in the wording, just that if an airworthiness limitation exists, you are compelled to comply with its requirements. This rule tells us that the Airworthiness Limitation carries the same level of urgency as an Airworthiness Directive. You might ask yourself how it is that the FAA could make such requirements for existing aircraft without going through the legal system of a Notice of Proposed Rule Making (NPRM) with a proper public comment period. That would be a very appropriate question. We know Cessna’s newly revised 210 service manual imposes a new financial burden on owners/operators of existing aircraft, which is not allowed according to several letters of interpretation from FAA Legal. However, this revision is an FAA approved Airworthiness Limitation, which 14 CFR 91.403(c) clearly states is absolutely required. However, the FAA is only allowed to create such a burden on owner/operators via the established airworthiness directive system. 14 CFR 43.13(a) says your mechanic must use a current version of the manufacturer’s service manual. The FAA has determined that “current” means the manual that was current at the time the owner chose the maintenance program. For that reason, an operator could choose to continue using the previous version of the service manual. To do this would require one to ignore the requirements of 14 CFR 91.403(c). I can tell you, not many mechanics are willing to step out on that ledge by themselves. The real question here is whether the FAA is trying out a new way to impose required maintenance that bypasses any public notice or comment period. Or, did the FAA personnel allow this airworthiness limitation to be published, with the FAA stamp of approval, due to a lack of understanding of their own regulations? Even more worrisome, do they intend to make this a habit? I can’t answer these questions but I’ve sent a letter to FAA legal for a formal interpretation on this issue with an expected reply time of at least 120 days. There’s no real problem with Cessna wanting this eddy current inspection, but it is a significant concern that the FAA isn’t following their own rules. If the FAA thinks there is a safety issue, then they should go through the proper process. I think we all know how they respond when one of us breaks the rules, so it’s reasonable to expect them to hold to their own standard. Hopefully, it won’t take the expected six months for a reply from FAA legal. When their letter does arrive, I’ll be able to complete this article and include a copy of legal’s findings. Until then, we’ll just have to follow our best guess as to what to do. The 210 is the first, but we need to know if it’s the last or the beginning of a new system for the FAA to create rule making without due process.